Although aware of the blues rock solid reputation of Laurence Jones live, this reviewer and rock fan had never managed to catch young Mr Jones and his band prior to this return visit to The Flowerpot. It was with some apprehension and trepidation then that the half hour jaunt was made to Derby – but it turned out to be a very worthwhile musical jolly. 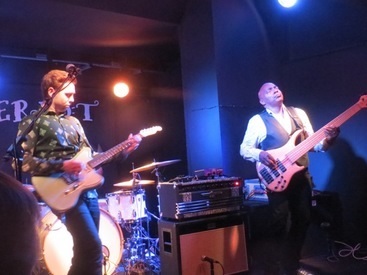 The Flowerpot was far from a sell-out, possibly due to the fact it fell on a school night, however those who did attend created a rousing reception and enthusiastic welcome for Laurence Jones and his band mates Roger Inniss (bass) and more recent addition Phil Wilson. The set list, quite naturally, spanned all three of Laurence Jones' studio albums to date (the auspicious debut Thunder In The Sky, the recorded in Louisiana Temptation and latest release, 2015's What's It Gonna Be) but a few tasty covers and some blues jamming were thrown in for good measure. A variety of musical styles were delivered in what seems effortless fashion by Laurence Jones and his band; from upbeat / up-tempo rock and traditional blues to the melodic and soulful, alongside the groove driven and the pop-based, all delivered to the highest of standards. Laurence Jones is so comfortable handling both vocal and guitar duties – and plays his instrument of choice with such skill – that it's difficult to believe he is still only twenty three years old. There is also a clear bond and musical understanding between Jones and bass player Roger Inniss (their playing and performances are top notch, no doubt honed from several hundred gigs together); Innis is the perfect sparring partner for Laurence Jones, whether that be head sparring, six and four-string sparring, vocal sparring or the having-far-too-much-fun smiley sparring. As regards highlights, a cracking and rocking version of Stevie Wonder's 'Higher Ground' (which will feature on the in-the-can fourth album) and an up-tempo 'Hoochie Coochie Man' went down well with the crowd, as did the melodically arranged covers of 'Good Morning Blues' and 'The Thrill Is Gone.' All four numbers helped display the versatility of the trio. Sam Bratley, lead man from The Black Circles (who delivered a solid 30 minute urban blues rockin' support set; check out their recent debut album Undone) joined the Laurence Jones Band for a couple of songs and no LJ show would be complete without the now obligatory, daren't-leave-it-out-the-set showcase number 'Thunder In The Sky,' featuring a prolonged, and quite stunning, guitar solo from Jones. Carrying a different musical weight and tempo, but no less excellent, was the heavy-pop enthused blues 'Fall From The Sky,' a highlight of the Temptation album. On this showing, a successful future for a young man who continues to grow in strength and stature.